As we make our way through the aftermath(s) of Something Happened Week, here’s a 2d6 (Xd6)-driven game from Michael Brown that lets the GM stew up their favorite “end of the world” scenario and launch a campaign around it. 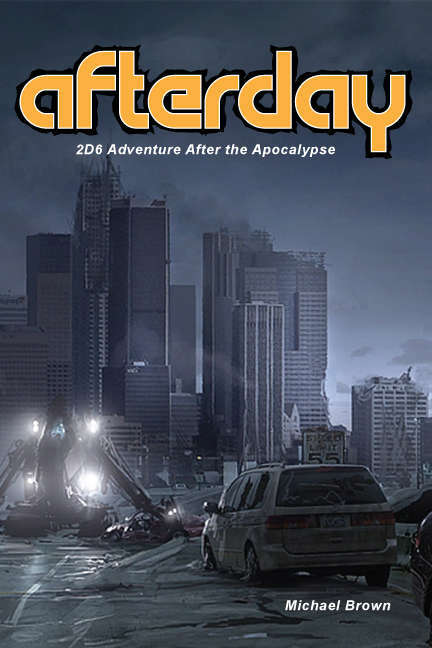 Whatever brought on the end, Afterday: 2d6 Adventure After the Apocalypse is about the beginning of a group’s adventures in the World That Comes After. The end of the world has held a morbid fascination since time immemorial. Stories concerning it can be found in the myths and oral traditions of many ancient cultures. In many of these stories, the world is destroyed (often as a byproduct of a war between deities or other supernatural entities) but remade anew or is returned to a chaotic or primordial state. The modern expression of post-apocalyptic fiction can be traced to the early 19th century and the works of Mary Shelley, Jean-Baptiste Cousin de Grainville, and Edgar Allan Poe. Of course, the advent of film, television, and the Internet has made such stories ubiquitous and introduced many commonly associated tropes, such as vast wastelands; predatory raiders (often mutated), and devices from the previous civilization held up as objects of desire and awe. and to top it all off, a system for creating settlements, the last bastions of civilization and survival. Afterday. It’s the end of everything…and the beginning of adventure.